In these wintery blustery months, we're turning to cosy comfort food. Gone are the days of the Summer salad - instead, give us the winter veg and delicous treats please and thank you. 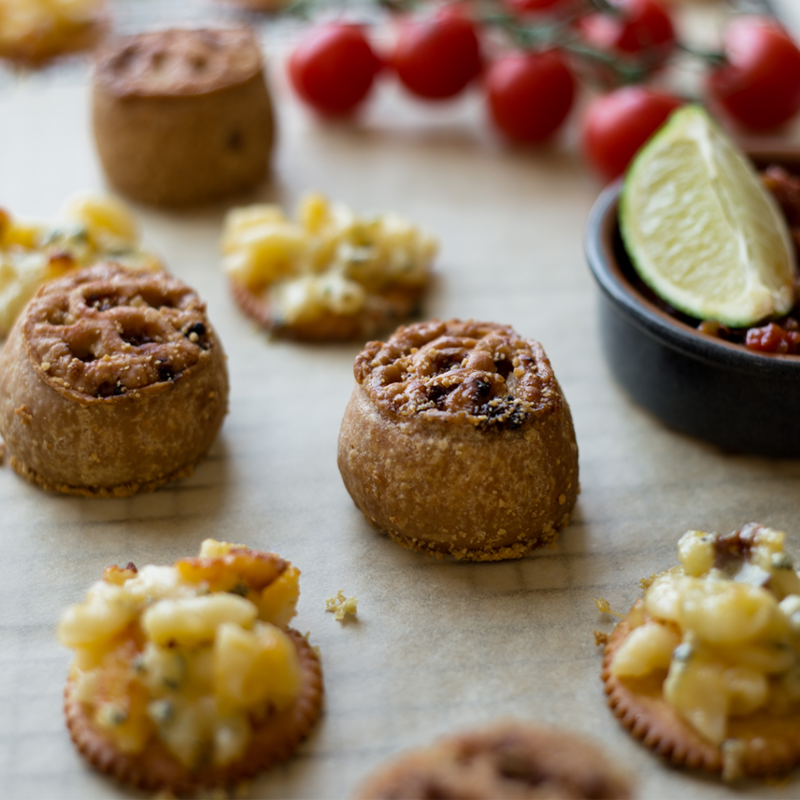 We wanted to share with you our recipe of the moment; mac and cheese bites with mini pork and pickle pies. In a pan full of boiling water, get started on cooking the macaroni. You want to cook it until it’s Al Dente. Whilst your macaroni is cooking, make sure all your ingredients in step 5 are measured out and ready to go – you want the cheese to melt from the heat of the cooked pasta so you need to get them all mixed together quickly so that happens. Add in; herbed cheese, milk, eggs, sour cream, grated cheddar, cold butter and a pinch of salt and pepper. Mix. Take out and sprinkle the optional cheddar ontop – you can either pop back in and melt that or keep it as a different texture on top. An easy to make macaroni cheese bites recipe – perfect for serving with Vale of Mowbray mini pork and pickle pies! You can scale the recipe based on how many guests you have. This works wonderfully if you have guests round for a relaxed evening – you can prepare this and serve it hot on a platter with mini pork pies, tomatoes and perhaps even some homemade tomato ketchup. Serve with your favourite wine or craft beer. We hope you’re all having a wonderful start to the year. There’s so much that will be happening in 2019 here in Yorkshire that we’ve got to look forward to. If you need any ideas of things to do – you can find them in our recent blog. If you’ve set New Years resolutions, we’d love to hear them. We’ve been thinking and we’re going to do more cooking this year. We’d love to think of more elaborate and delicious recipes for accompaniments to a pork pie. Of course, we will be sharing them with you all so keep checking our blog and follow us on Twitter, Facebook and Instagram where we will keep you up to date when we post a new recipe!